A friend has a little grandchild coming to visit and because they must fly to get here, the mum is upset that she can't bring the baby's quilt with her. Well! There's nothing I like more that a reason to put bits of fabric together! I made a "low volume" block a few months ago, jumping on the bandwagon a bit. But it didn't speak to me, so I never did anything with it. I know the baby's mum loves foxes, so I thought I'd use the block and just add borders to it until it became a useful size, so that's what I did. It is still not as bright and cheerful as I prefer, but it's fine and I'm delighted to have finished something that will be used. It's about 36" square, so a good size for a baby to lie on the grass. The back is just a piece of cheerful Ikea fabric. 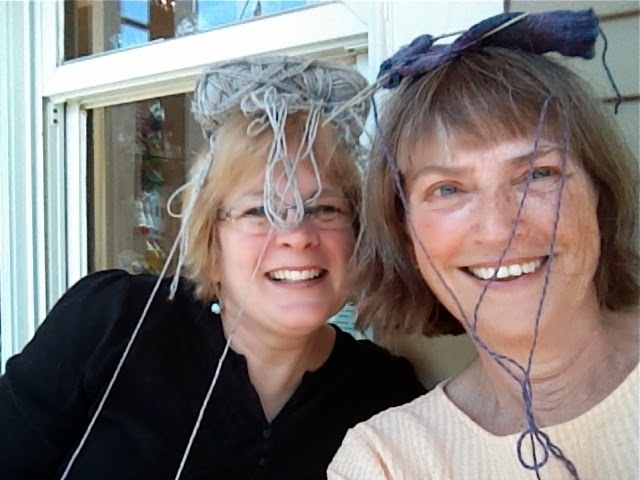 On a different note, a friend and I went to Sutton on Saturday to participate in a Knit in Public event organized by the local yarn shop, Mont Tricot. It was fun and quite a few showed up to chat and show off projects. I brought my ubiquitous socks and Norma brought a sweater she was working on but got involved with a nasty snarl of yarn. Of course, we got silly too, but it was fun! 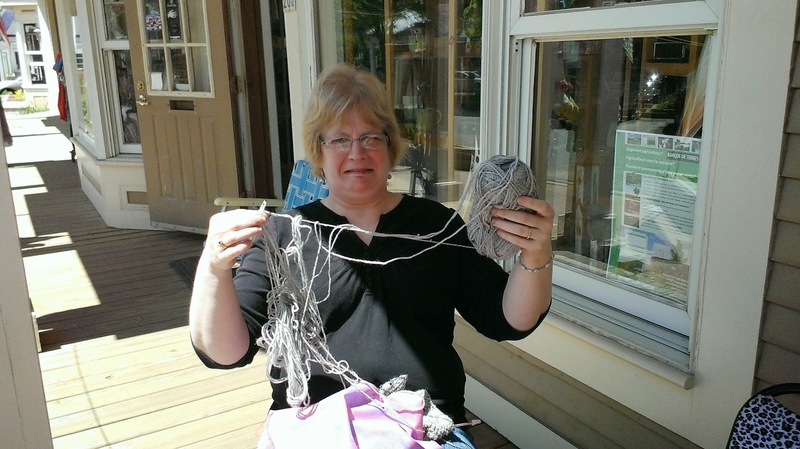 I'm linking up with the Needle and Thread Network, so take a look and see what's going on. That is so thoughtful to make a gift for your friend's grandchild-that is the perfect size for play time on the floor or outside. What a sweet baby quilt, Margaret! Love those fun photos with you and your pal, Norma. You guys look like you had a great time! Thanks for sharing at the Let's Bee Social!